This book (by Mark Andrew Smith and Matthew Weldon) is about a group of kids who have explorers for parents and their parents die after freezing under snow and ice on an expedition. The kids are two pairs of siblings – brothers and sisters. They move into their godfather's house after their parents die. They find all these goblins and ghosts and stuff in the woods near their godfather's house. The goblins tell them of Galomar, an evil person. The kids decide sneak into Galomar's house and steal things for a library that will open to another magical land. They also believe Galomar has killed their parents, but they then find out Galomar is really their grandfather. The kids get out of his house with the stolen maps and books for the magical library. 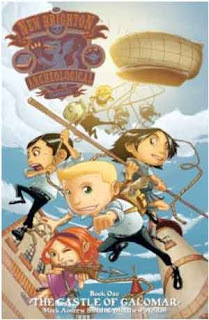 The book ends in a cliffhanger as the kids fly off in a blimp to look for more artifacts and then, in an epilogue, Galomar is seen trying to steal more items, too. The magical beings are the coolest because of the details of the drawings. The illustrator has made all the characters have fat heads. I liked the fat heads for the magical creatures, but it was just okay for the kids. The kids look really strange at times. Some of the pictures have a manga-style, with big eyes and face gestures. I think this would be good for the classroom because teachers don't usually have comics. It's neat that it has magical people. A teacher could use it for predicting what will happen next in the series (like: they will go, get the books for the library, beat Galomar and everybody likes them ... just like every book like this one). I would recommend this to other kids because it has a lot of action and a lot of magical people in it. This book is appropriate for upper elementary school students. There are no swears. There is fighting but not much blood. Colin is a fifth grader in Massachusetts. He writes a lot of his own comics and produced his own movies, including stop-motion animation. He is awesome at sports, including baseball and basketball. He loves Garfield comics and he has read almost every Tin-Tin book a few times over. I enjoyed reading your review of the Castle of Galamar. I don't read graphic novels or comic books myself but I'm always on the lookout for new titles for children to read. You are a fifth grader. Would you recommend this for any particular age or grade range? I would say it is good for students in grade four through six.